Devastating earthquakes have struck parts of Indonesia, leaving hundreds dead and thousands homeless. Communities are facing the loss of loved ones, homes and livelihoods. 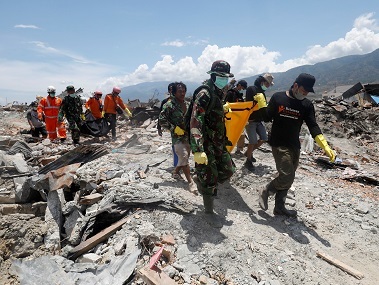 The tsunami, which crashed into the coastal city of Palu on Sulawesi island, has left over 1,900 people dead, hundreds injured and many homes, businesses and local services destroyed. Around 48,000 people have been left homeless. The United Nations Office for the Co-ordination of Humanitarian Affairs says there are nearly 200,000 people in urgent need of assistance, about a quarter of them children. Responding to a disaster of this magnitude presents huge challenges. Communications are limited, and damaged roads, bridges and airports all make it extremely difficult to get emergency aid to survivors. Further, many hospitals have been damaged or destroyed. There is an urgent need for temporary shelters, medical supplies, food and clean water. Long term help will be needed to help families rebuild their homes and livelihoods in the months and years ahead. SCIAF is working closely with Caritas Indonesia and others who are now distributing food, water, and non-food items like soap and blankets to families in need in Palu. By phoning 0141 354 5555 or by clicking here you can help SCIAF to provide emergency support to those who need it most by donating to the emergency appeal.